egypt tourism: How Did King Tut Really Go? 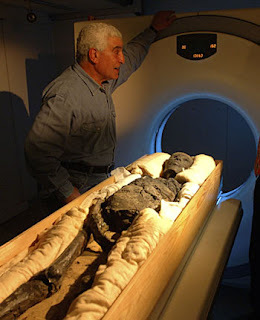 How Did King Tut Really Go?! He died 3,300 years ago and we know that he was 19 years of age when he did. We know that he came to the throne at the age of 9 and was too young to have made his own decisions, and that they were made for him by Aye, his vizier and Horemheb, the commander-in-chief of his army. We think he was Akhenaton's son not from the famous Nefertiti but from Kiya a minor wife. He may have had a brother Smenkhkare, or as some think he could have been is father after all. He did have six half-sisters from Akhenaton and Nefertiti (if Akhenaton was his father really!). He was married to his probably half-sister Ankhesenamun and had twin girls who were stillborn and buried with him in the tomb. But even Ankhesenamun's fate is unknown, as she was made to marry Aye after her husband's death then just disappeared out of existence. 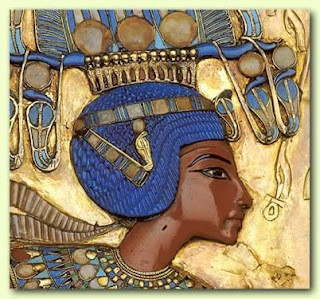 We know that Tutankhamun was the King that brought back the old religion after the revolution of Akhenaton, who banned the worship of Amun in favor of the one god Aten (Atenism), which was represented by "the disk of the Sun". This gained him instant popularity with the priests and the people, so he was a loved king! Contrary to what was concluded that he was buried in haste, clues have shown that the mummification process and burial took their due course. For some reason when Horemheb came to power he deleted all evidence of existence of his predecessors Akhenaten, Neferneferuaten, Smenkhkare, Tutankhamun, and Aye who were erased from the official lists of Pharaohs which instead reported that Amenhotep III was immediately succeeded by Horemheb. This may have been a way for Horemheb to delete all trace of Atenism and of any pharaoh associated with it from historical record. Akhenaten's name never appeared on any of the king lists compiled by later Pharaohs and it was not until the late 19th century that his identity was re-discovered and the surviving traces of his reign were unearthed by archaeologists. 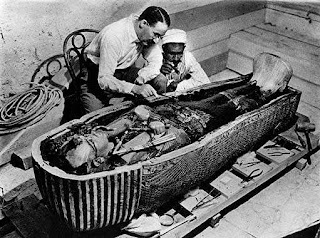 Before Howard Carter discovered Tutankhamun's intact tomb in 1922 the world had never heard of King Tutankhamun and the discovery led to a renewed public interest in ancient Egypt. Since then his burial mask has become synonymous with all of Egyptian history. But at the time of discovery Carter and his team basically dismantled the corpse while looking for amulets and other jewelry. The mummy's head was removed and nearly every major joint severed, furthermore, many of its parts present at the original examination are now missing. 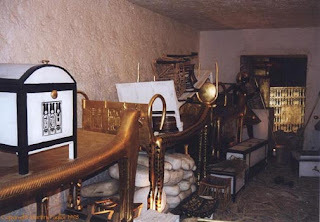 But then if Carter hadn't cut the mummy free from the hardened resin that cemented it fast in the wooden coffin, thieves would certainly ripped it apart to remove the gold. Archaeology has significantly changed over the years, back then it was more important to discover and collect treasures, not paying enough or any attention to details of life and the intriguing mysteries of death, even if that meant leaving the antiquities badly damaged or in a critical state. 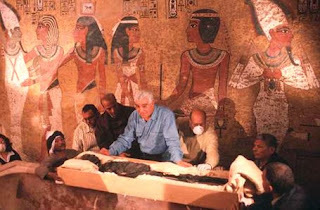 Since 1926, the mummy has been X-rayed three times: first in 1968 by a group from the University of Liverpool led by Dr. R. G. Harrison, then in 1978 by a group from the University of Michigan, and finally in 2005 a team of Egyptian scientists led by Secretary General of the Egyptian Supreme Council of Antiquities, Dr. Zahi Hawass, who conducted a CT scan on the mummy, acquiring 1,700 three dimensional images during the 15 minute scan. The early X-rays raised alarms that the deceased was murdered. But did the young pharaoh die from a blow to the head? Well …..apparently not!! 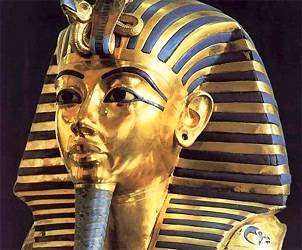 After the detailed CT scans taken recently King Tut died of natural causes. Although some Egyptologists and amateur sleuths have long speculated that a stealthy foe murdered Tut by attacking him from behind, the evidence is all circumstantial, with very little reason to believe that murder was the primary scenario. So lets look at evidence just a tad-bit closer. Among claims that King Tut may have died of the Black Plague (which had appeared at the time), of lung disease, poison or even a brain tumor, the major allegation of a fatal blow to the back of the head have all proved futile. The damage to the skull that raised cahoots has proven to be due to damage by the embalmers during the mummification process or carelessness of the Carter team. What was actually determined, though speculation, but the most agreed on, is the fact that there was a fracture found on the left leg of the mummy, which did not show evidence of healing, meaning that it was received just before death. And again from what we learnt of his life painted on the walls of his burial chamber, like all Pharaohs, King Tutankhamun studied reading, writing, mathematics, geology, astronomy, a foreign language and for fun and relaxation he learnt, archery, wrestling and how to drive a chariot. But as it seems he had a deep infatuation with hunting, which may have been the root cause of his demise. Whatever caused the fractured thigh bone is likely to have also caused an open wound that was serious enough to cause an infection, fever and death. Although the break itself would not have been life-threatening, but gangrene caused by a badly broken leg was the most likely culprit. So was it a hunting accident that brought the end to a Dynasty of Kings? We may never know. Many questions have yet to be answered about the life and death of the Boy-King, and may even remain a mystery buried under the sands of time like many still unsolved mysteries of the Valley of the Kings.